Unfortunately, due to ongoing construction at the train station and other circumstances beyond our control, it is not feasible to continue with plans for this year's event. We will be redirecting our focus on smaller events at the Fullerton Train Museum. This decision was not made lightly. We love holding Railroad Days and seeing the community come together to share their love of railroading. As well, we know how much you enjoy being a part of Railroad Days. We anticipate that we can continue next year and hope that you will all return as well. In the meantime, we would love to see you come by the museum to say hello. We are open every 1st and 3rd Saturday of the month, from 9-12. 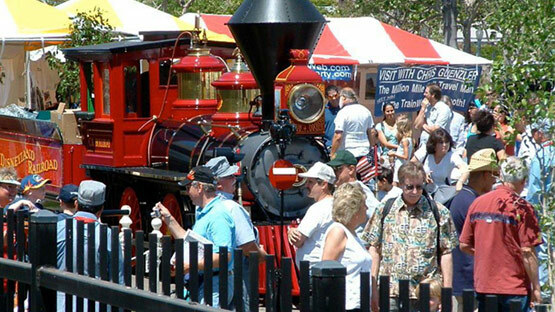 The Southern California Railway Plaza Association, Inc., or SCRPA, is a volunteer organization focused on the promotion of train-related educational programs for our youth, plus activities and exhibits for people of all ages – dedicated to the preservation of the rail heritage of Southern California. SCRPA is administered by a Board of Directors that includes people knowledgeable in railroad operations, organization administration, public affairs, nonprofit organizations and various technical specialties. Our mission is to provide a historical insight into the numerous contributions that railroads have made to the development and growth of our region from the 19th century onward.